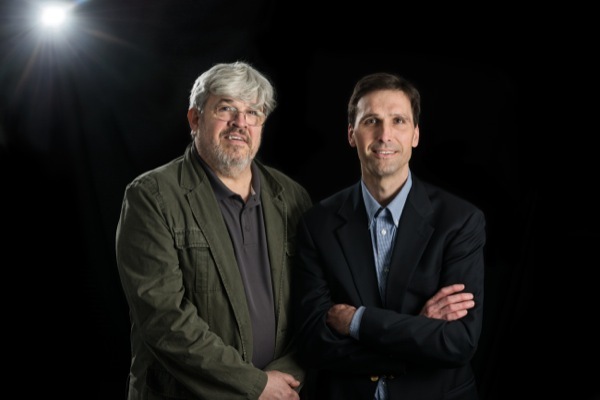 NASA has awarded UD physicists William Matthaeus (left) and Michael Shay a $1.2 million grant to explore how energy from the sun is transported across the heliosphere. Click on this link to see a UD animation of plasma, the fourth state of matter, which makes up the solar wind, stars and lightning. Giant explosions can occur in plasmas when energy stored in magnetic fields is suddenly released, generating shock waves and accelerating particles through space. The UD team is studying this transport of energy from the sun. 3:29 p.m., June 12, 2014--We couldn’t survive on Earth without our shining star  the sun  93 million miles away. Yet we have much to learn about the environment called the heliosphere that surrounds the sun and planets like a giant teardrop, extending past Earth and beyond Neptune to the edge of the solar system. It’s a place where the solar wind flows and solar storms occur, sending out billions of volts of energy. Knowing more about the heliosphere matters, says University of Delaware physicist William Matthaeus, if we ever want to build a space station on the moon, send astronauts to Mars, continuously protect satellites and electrical systems on Earth, and even factor in the effects of space weather on our changing climate. Matthaeus and co-investigator Michael Shay, an associate professor in UD’s Department of Physics and Astronomy, have been awarded a three-year, $1.2 million grant from NASA’s Heliophysics Grand Challenges Program to explore how energy from the sun is transported across the heliosphere. Scientists Arcadi Ismanov and Melvyn Goldstein from NASA’s Goddard Space Flight Center and Vadim Roytershteyn at the Space Sciences Institute also will collaborate on the project. The UD team will draw on their expertise in theoretical physics and reconnection physics, respectively, to develop simulation models of solar energy transport from macro- to micro-scales, ranging from the global solar wind to microscopic movement of space plasma, which makes up the solar wind, stars and lightning. “We’re working to explain something in nature that has never been explained before,” says Matthaeus. “The coupling between these different regimes is one of the most fundamental problems in space physics and one of the greatest ones,” notes Shay, who will be using supercomputers across the country to do the massive calculations required in the research. The project’s “cross-scale couplings” will involve turbulence theory and modeling, plasma physics theory and kinetic plasma simulation. Recently, Matthaeus and Shay met with experts in ocean sciences, engineering, and other fields to create a new working group on the UD campus. 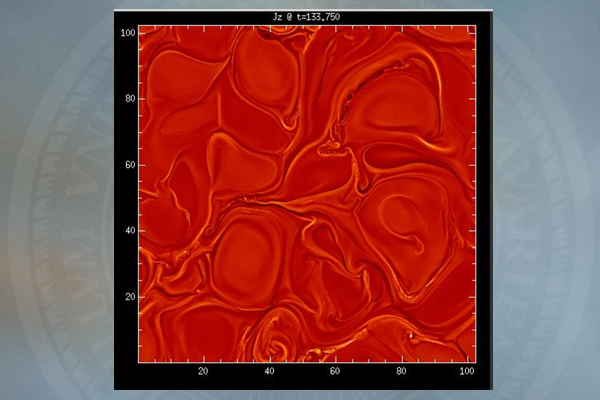 Turbulence Research on Environmental and Astrophysical Transport (TREAT) will examine issues of turbulence, the violent movement of air and water, and also investigate how findings about ocean wave flow may inform space science and the propagation of the solar wind. “Sometimes bursts of solar wind  coronal mass ejections  shake Earth so hard they cause reconnection events,” Matthaeus says, referring to the crossing and reconnecting of the magnetic fields that travel in opposite directions at the planet’s poles. That’s when large amounts of energetic solar wind particles, trapped by Earth’s magnetic field, are accelerated toward Earth. These high-energy particles can potentially knock out satellites, disrupting communications, take out power grids, and cause planes to be re-routed from flying over the poles to avoid exposing pilots and passengers to harmful radiation. “We really want to understand the place our planet has in the universe, and the first thing is to understand its place in the neighborhood,” Matthaeus says.